An Occupational Hygienist utilizes the teachings of both science and engineering in order to identify and understand hazards in the workplace and the risk to the health and safety of employers and employees. It is their role to identify potential risks from exposure to biological, chemical, psychosocial, physical and ergonomic hazards within the workplace and the course of carry out work-related duties. The Australian Institute of Occupational Hygienists describes “occupational hygiene as the art and science dedicated to the Anticipation, Recognition, Evaluation, Communication and Control” of hazards that may affect employees and employers in the workplace. Hazards are anticipated based on precedent in certain industries or environments where it can be foreseen that there may be the danger to those exposed. From here, the Occupational Hygienist would then review the workplace or environment and recognize and evaluate whether there is a presence of a threat. Evaluation is an essential aspect of the process as it is from here that the level and degree of danger is assessed, the types of hazards that are present are established and the extent to which they can impact employers and employees that are exposed to them. Communication encompasses training and education for both employers and employees to create awareness of the risks of which they’re being exposed. Communication also embraces education on procedures to avoid, minimise and manage those dangers when that same work is carried out in the future. The element of control with Occupational Hygienist’s entails controlling the hazardous substance, situation or action in order to ensure that no harm comes about to employees or employers participating in the activity in the future. This will be formalized in procedures and policies likely to determine the safest course of action to complete the task that will result in the safest and healthiest environment for employees and employers. 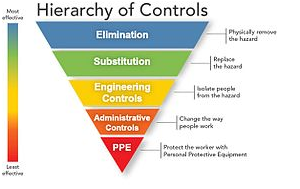 Occupational Hygienists will look to see whether it is possible to eliminate the hazard or substitute the source of the hazard (such as substituting a specific chemical with a safer chemical) before reviewing and recommending specific engineering control measures or even Administrative or PPE controls. Occupational Hygienists also pay heed to the terminology used by Inspectors from SafeWork NSW and other enforcement agencies for example – an Inspector may state the following requirement for the control of a hazard – the control must be ‘ Reasonably Practicable ‘ and this has been defined by SafeWork NSW to Hazmat Services’ Occupational Hygienists as meaning that in controlling a workplace hazard the Inspector will expect the business to have done a review to determine that Elimination and Substitution are not possible for a reported hazard and then the onus will be on Engineering control options (with formal quotes) to determine whether such a higher order control measure is ‘ disproportionally expensive ‘before accepting the proviso that lower control measures such as PPE are acceptable. Occupational Hygienist’s assess and manage hazardous substances and situations in industries of all types. Contact us today to protect your workplace today and in the future.